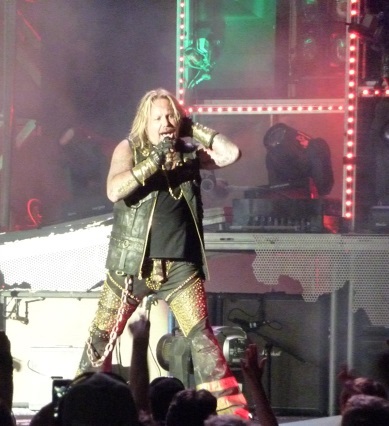 If this truly is Motley Crue’s Final Tour – then what a way to go out. Known as much, if not more, for their antics off stage than their music on stage, the Bad Boys from Hollywood played to a massive sell-out crowd on Saturday at the Sleep Country Amphitheater in Ridgefield, WA just north of Portland, OR. Dubbed “The Final Tour” Motley Crue played a solid 20 song nearly two-hour set of hits mostly from the 1980s and nearly every album represented, at least the ones the original four, and therefore the classic lineup, all played on. Motley Crue from 1994 infamously left out singer Vince Neil and New Tattoo in 2000 saw drummer Tommy Lee split from the band. The Crue opened with a bang and blinding explosions with “Saints of Los Angeles” the title song off their most recent album, now six years old. “Wild Side” was next and the band even got in the single release “Primal Scream” featured on their “best of” album “Decade of Decadence” from 1991. Up next, “Same Ol’ Situation (S.O.S. )” with that great guitar riff was the first of five songs from 1989’s Dr. Feelgood and the “Looks That Kill” one of many songs about the band’s favorite subject, women, was straight-up hard rock. For its part, the band played tight most of the evening. Neil still has that crazy high-pitched almost nasally falsetto. Sometimes it gave out when pushing his limits but he quickly cut away from the mic. Physically however, Neil doesn’t seem to be in peak tour shape, yet. Though he pranced around like a man 30 years his junior, he’s gained some significant weight, only notable because he clearly was winded at times especially on the set closer “Kickstart My Heart” when he seemingly dropped the lyrics to catch his breath. But the band played on and Neil figured out when to jump back in with the chorus. The show was certainly not without great stage effects throughout. Strobes and other intense light often backed the band members, but fire was the most popular accompaniment. 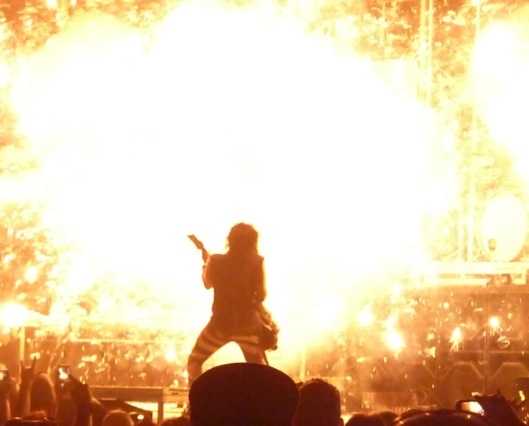 Whether it was a shower of sparks on “Without You,” flame geysers all evening that lit up the audience or Nikki Sixx’s flame throwing bass he used on “Shout at the Devil,” Motley Crue knows how to bring an entertaining stage show. The usually loud-mouthed Lee let his arms do all the talking as he didn’t say a word until the final bow with all four members of the band. He actually seemed happy unlike the band’s last venture through Portland on The Tour with Kiss. Back then Lee seemed ticked off most of the night and even dismissed the crowd as not loud or boisterous enough for his liking. Whatever his perceptions were it was not the case on Saturday. The crowd was roaring and gobbled up every song except for “Muther… of the Year” which was really the only time the crowd held back a bit. Maybe because dad’s were bringing their kids? Lee’s drum set felt a bit stripped down but he hammered away like a maniac and every beat was felt. Quite surprisingly, no 360 degree loop with Lee strapped into his drum set and soloing upside down which is a bit incredulous considering the grandiose nature of such a feat and it being the band’s farewell tour. You’d think Motley Crue would pull out all the stops. But Motley Crue have always done things their way a fact reinforced by the band as Frank Sinatra’s “I Did it My Way” played over the loudspeakers for walk-out music. Name another act that convened a press conference to announce a signed contract to permanently end the band after the current tour. 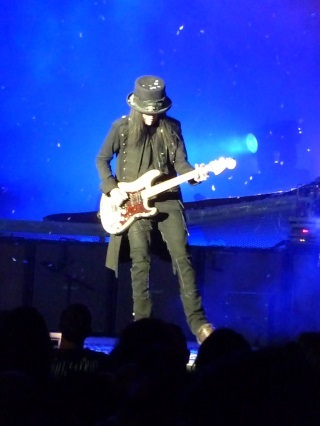 Perhaps guitarist Mick Mars deteriorating condition influenced the band’s decision to call it quits. Mars had a hip replaced 10 years ago and at 63 years old, a decade older than the rest of his mates, it’s clear his arthritis is getting the better of him. Mars has battled ankylosing spondylitis since he was a teenager. Except for his hands and fingers. Mars didn’t move much more than a few yards from his spot on the stage but he ripped up and down the fret board and shredded on solos for “Smokin’ in the Boys Room,” and “Dr. Feelgood” that gives that almost iconic guitar intro and is one of the great rocks songs of the 1980s. He also showcased his talents on a solo near the end of the evening. 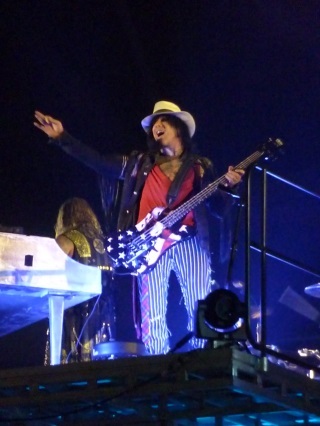 Sixx, who is that rarest of bassists who doesn’t just sit in the back playing softly, simply pounded on his instrument. Prior to the band’s version of “Anarchy in the UK” Sixx provided an overview of how the band met which after hearing the story, if you haven’t already read it in the band’s tell-all book “The Dirt,” the four seemed destined to find each other. Motley Crue formed on January 17, 1981 playing “Live Wire” the first song on their first album Too Fast For Love. That first song was one of three songs played live from the debut album. The other two “On With the Show” and the title track didn’t hold up well but primarily because Neil’s vocals were completely swallowed by the rest of the music. As is seemingly the case with all glam rock bands, Motley Crue nailed the ballads. “Without You” showcased great vocals from Neil and of course brought out the cell phones (no more cigarette lighters!) and “Don’t Go Away Mad (Just Go Away)” is one of the band’s finest. “Girls Girls Girls” of course had two scantily clad women dancing along to the music and, no, that wasn’t the only time the women appeared on stage. The opening set ended with the fantastic “Kickstart My Heart” a song that never would have been recorded had Sixx not been brought back from the dead after a heroin overdose. Does it get any better than this song? It simply rocks. Motley Crue encored on a stage in the middle of the crowd and showed their soft side by closing the evening, quite poetically, with “Home Sweet Home” as if to say after 34 years of debauchery all they really want to do is go home. Of course, if they all run out of money in a few years they can come back with the Just Kidding tour. Alice Cooper opened the show and performed more like a headliner. He absolutely blitzed through an 11-song set in about 50 minutes. There were obvious difficulties with the stage set-up as the gates to the venue didn’t open until nearly 10 minutes before the 7 p.m. start. Cooper didn’t jump on stage until 7:40 p.m. as stage hands were busy trying to figure the various electrical wires for about 30 minutes. He played all the classics, brought out a giant Frankenstein for what else, “Feed my Frankenstein,” a live snake on “Welcome to my Nightmare” and even had his head chopped off via guillotine. Cooper is indeed the master of Theater Rock.